Important: P&F Price Objectives are upside and downside price targets that stem from a P&F buy or sell signal. These price objectives should not be used as the sole reason for buying or selling a security; they are just general guidelines on what to expect based on the strength of the initial price move. Some securities reach their price objective, but others reverse before doing so. A lot can change after a given signal. Chartists should continually monitor the technical situation for signs that validate or invalidate the Price Objective. StockCharts automates Point & Figure price objectives using the Breakout Method and the Reversal Method, both of which are based on the vertical length (height) of a Measure Column. The longer the Measure Column is, the higher or lower the price objective. Identification of this column depends on the method, Breakout or Reversal. This article will show chartists how to find the Measure Column, how to calculate the length of the price move and how to determine the Price Objective. Note that different scaling methods can affect the Price Objectives. Most of the examples below are with Traditional Scaling, which is a half point per box below 20, 1 point between 20 and 100, 2 points between 100 and 200, and 4 points between 200 and 400. Price objectives can change when using dynamic ATR scaling and percentage scaling. Chartists looking to calculate their own price objectives may wish to try “user-defined” scaling to ensure a uniform box size. This will make calculations and objectives much easier to ascertain. Also, keep in mind that these price objectives are not “hard levels”. Instead, they are “soft areas” that chartists can use as a broad guideline. The Breakout and Reversal Methods do not take into account classic P&F patterns, such as Triple Top Breakouts, Triple Bottom Breakdowns, and High-Pole Reversals. These patterns may indeed be present, but they do not figure into the calculations. Instead of these patterns, the Breakout and Reversal Methods use basic P&F buy and sell signals. A basic P&F buy signal is a Double Top Breakout, which occurs when an X-Column exceeds the high of the prior X-Column. Because X-Columns represent rising prices, a P&F buy signal is essentially a higher high and higher highs are present in uptrends. A basic P&F sell signal is a Double Bottom Breakdown, which occurs when an O-Column exceeds the low of the prior O-Column. Because O-Columns represent falling prices, a P&F sell signal is essentially a lower low and lower lows are present in downtrends. The chart above shows Best Buy (BBY) with some basic P&F signals highlighted in green (buy) or red (sell). As the most prolific P&F signals, chartists can expect to see a lot of these on any given chart. Only a few of these signals are highlighted on the BBY chart. The blue arrow highlights the current signal, which is a basic P&F buy signal. There is always a current, or active, signal in play on a P&F chart, which means there is either an active P&F buy signal or an active P&F sell signal in play. It is one or the other, not both. There are four steps to finding a Bullish Price Objective with the Breakout Method. Before starting, make sure “Breakout” is selected as the Price Objective method and the active signal is a P&F buy signal, which means there will be a Bullish Price Objective visible in the upper left corner of the chart. First, working from right to left on the chart, find the most recent P&F sell signal (Double Bottom Breakdown). This is necessary to identify the column that reversed this P&F sell signal with a P&F buy signal. Second, work to the right of this P&F sell signal and find the next P&F buy signal (Double Top Breakout). The column that produces this P&F buy signal is key because it was strong enough to reverse the P&F sell signal. It is now the Measure Column. Keep in mind that this Measure Column might not be the one that produced the most recent P&F buy signal on the chart. It is simply the one that reversed the prior P&F sell signal. Third, calculate the height of the Measure Column and multiply it by the box reversal amount. There are two possible methods to calculate the height. In most cases, chartists will just subtract the low from the high of the column (65 - 60 = 5) and multiply by the box reversal amount (usually 3 for a 3-box reversal). This is usually best when the box sizes are different, which can occur at different price levels, when using dynamic ATR scaling or when using Percentage scaling. If the box size is equal, chartists can use the other method: count the number of filled boxes in the Measure Column, multiply by the box size and then by the box reversal amount (typically 3). Fourth, add this total to the low of the column just before the Measure Column. Because the Measure Column forms with an X-Column that produced a P&F buy signal, the column immediately to the left will be an O-Column. The chart above shows Citrix (CTXS) with a Bullish Price Objective of 74, which can be seen in the upper left and on the right scale (green ovals). Just the fact that we see a Bullish Price Objective tells us that the active signal is a P&F buy signal. Now we can look for the most recent sell signal, which occurred in January (red arrow). Working to the right of this sell signal, the next buy signal triggered in February (red 2 on the breakout column). This is the column that reversed the P&F sell signal and it becomes the Measure Column. For height, the Measure Column is five boxes (X's) and each box is 1 (5 x 1 = 5). Alternatively, the high of the column is at 65 and the low is at 60 (65 - 60 = 5). The height is multiplied by the reversal (5 x 3 = 15) and this total is added to the low of the prior O-Column for a Bullish Price Objective (59 + 15 = 74). Notice that the Citrix example shows a fixed Measure Column because there was a three-box reversal to lock in column height. Despite two falling O-Columns and small declines, the buy signal and Bullish Price Objective remain in force until countered with a P&F sell signal. The Bullish Price Objective is tentative when the Measure Column is not yet fixed and subject to change. The chart below shows General Motors (GM) with a “tentative” Bullish Price Objective of 48 (upper left). Notice that this Price Objective is not on the actual P&F chart because it is off the scale. The Bullish Price Objective is tentative because the Measure Column is not yet fixed and still subject to change if prices extend higher. A move above 39 would warrant another X and increase column height, which would, in turn, increase the Bullish Price Objective. This column will not be fixed until there is a three-box reversal with an O-Column that fills three boxes to the downside. Such a move would not, however, negate the P&F buy signal and the Bullish Price Objective remains valid until a P&F sell signal. There are four steps to finding a Bearish Price Objective with the Breakout Method. Before starting, make sure “Breakout” is selected as the Price Objective method and the active signal is a P&F sell signal, which means there will be a Bearish Price Objective visible in the upper left corner of the chart. First, working from right to left, find the most recent P&F buy signal. This allows us to find the column that reversed the P&F buy signal with a P&F sell signal. Second, work to the right of this P&F buy signal and find the next P&F sell signal. The column that produces this P&F sell signal is important because it was strong enough to reverse the P&F buy signal. It is now the Measure Column. Keep in mind that this Measure Column might not be the one that produced the most recent P&F sell signal. It is simply the one that reversed the last P&F buy signal. Third, calculate the height of the Measure Column and multiply it by 2/3 of the box reversal amount. There are two methods to calculate column height. First, chartists can subtract the column high from the column low. Second, chartists can count the number of filled boxes and multiply by the box size. The column height is then multiplied by 2/3 of the box reversal amount, which is typically 3 (3-box reversal). Using 2/3 for bearish counts is advocated by A.W. Cohen, a pioneer in P&F charting, and Tom Dorsey, author of Point & Figure Charting. Fourth, subtract this total from the high of the column just before the Measure Column. Because the Measure Column forms with an O-Column that produced a P&F sell signal, the column immediately to the left will be an X-Column. The chart above shows American Express (AXP) with an active P&F sell signal and a Bearish Price Objective. The most recent P&F buy signal occurred in December 2014 (red c) and a P&F sell signal followed with the long O-Column in January 2015. This O-Column became fixed after the counter-trend bounce with the subsequent X-Column (red 2). This means the height of the Measure Column remains fixed and the Bearish Price Objective will not change until a P&F buy signal negates it. The column extends 10 boxes, each box is 1, and the box reversal amount is 3 (10 x 1 x 3 = 30). Chartists can also just subtract the high from the low (91 - 81 = 10) and multiply by 3. At this point, we need to take 2/3 of the total and subtract this from the high of the X-Column just before the Measure Column (30 x 2/3 = 20 and 91 - 20 = 71). The chart above shows Garmin (GRMN) with an active P&F sell signal and a tentative Bearish Price Objective because the height of the Measure Column is not yet fixed. In other words, the measuring column could still extend lower and this would affect the Bearish Price Objective. The Measure Column will become fixed when there is a 3-box reversal and rising X-Column that fills three boxes. Even with this counter-trend move, the Bearish Price Objective will remain valid until there is a P&F buy signal. There are three steps to finding a Bullish Price Objective with the Reversal Method. Before starting, make sure “Reversal” is selected as the Price Objective method and the active signal is a P&F buy signal, which means there will be a Bullish Price Objective visible in the upper left corner of the chart. First, working from right to left on the chart, find the most recent P&F sell signal. The X-Column next to the sell signal column represents the first bounce after the sell signal; this column then becomes the Measure Column. Second, calculate the height of the Measure Column and multiply it by the box reversal amount. Third, add this total to the low of the column just before the Measure Column, which will be the column that produced the most recent P&F sell signal. The chart above shows Mosaic (MOS) with a Bullish Price Objective at 64 using the Reversal Method. This means the active signal is a P&F buy signal. To calculate this Price Objective, first find the sell signal prior to this buy signal. The column next to the sell signal column becomes the Measure Column and the height is 8. Multiply this number by the box reversal amount (8 x 3 = 24) and add this total to the low of the column before the Measure Column. The Bullish Price Objective is 64 (40 = 24 = 64). The Reversal Method is also subject to “tentative” Bullish Price Objectives when the Measure Column is not yet fixed. This occurs when the X-Column to the right of the sell signal triggers a P&F buy signal. The chart above shows LyondellBasell Industries (LYB) triggering a P&F sell signal with an O-Column in March, reversing with an X-Column and then triggering a P&F buy signal in April (red 4). This column extends to 94; should prices move higher, another X will be drawn, which would affect the Bullish Price Objective. The Measure Column will not become fixed until there is a three-box reversal and a decline with an O-Column. Such a reversal would not negate the P&F buy signal, but it would fix the height of the Measure Column and the Bullish Price Objective would remain valid until countered with a P&F sell signal. There are three steps to finding a Bearish Price Objective with the Reversal Method. Before starting, make sure the active signal is a P&F sell signal and there is a Bearish Price Objective visible in the upper left corner of the chart. First, working from right to left on the chart, find the most recent P&F buy signal. The O-Column next to this buy signal represents the first decline after the buy signal; this column then becomes the Measure Column. Second, calculate the height of the Measure Column and multiply it by 2/3 of the box reversal amount. Third, subtract this total from the high of the column just before the Measure Column, which will be the column that produced the most recent P&F buy signal. The chart above shows KLA-Tencor (KLAC) with an active P&F sell signal and a Bearish Price Objective on the chart. Working from right to left on the chart, the first P&F buy signal shows an X-Column with a high at 70. The next O-Column is the Measure Column and its height is 10, which is then multiplied by the box reversal amount and 2/3 (10 x 3 x 2/3 = 20). This amount is then subtracted from the high of the buy signal column for a downside Price Objective (70 - 20 = 50). Bearish Price Objectives with the Reversal Methods are “tentative” if the height of the Measure Column is subject to change. This usually occurs when a P&F sell signal immediately follows a P&F buy signal. The O-Column generating the P&F sell signal becomes the measure column and its height is not fixed until there is a three-box reversal (X-Column with three boxes). The chart above shows Hewlett Packard (HPQ) with a buy signal in November as the X-Column moved above the prior X-Column. This buy signal was immediately reversed with the next O-Column and a “tentative” Bearish Price Objective has been set. The O-Column is not yet fixed because a decline below 31 would warrant another O and an adjustment to the Bearish Price Objective. Once a stock reaches its price objective, MET! appears next to the Price Objective in the upper left corner of the chart. After meeting this objective, a new price objective will not appear until the stock generates a new bullish or bearish setup. The first chart below shows Amazon with a Bullish Price Objective (Tentative) of 375, which fits in the 372 box because each box is 4 points and this box covers 372, 373, 374 and 375. The second chart shows Amazon with Bullish Price Objective MET!. Price Objectives provide chartists with a general price target based on the vertical length of the Measure Column. The longer the Measure Column is, the higher or lower the Price Objective. Price Objectives based on the Reversal Method, Breakout Method or any other method should be taken with a grain of salt. Consider these targets as broad guidelines. Securities will not always reach their targets, and some will even reverse course and trigger conflicting P&F signals before reaching their target. A P&F signal and a target are simply the starting point for analysis. Conditions can change, so chartists must regularly monitor the unfolding chart formation for evidence that would invalidate their original premise. 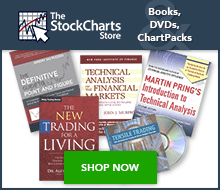 It is also important to employ other technical analysis tools to confirm or refute a premise. For example, chartists can apply basic trend analysis on a bar chart or use bar chart based indicators to confirm the findings on the P&F chart. StockCharts users can access P&F Price Objectives by selecting “Reversal” or “Breakout” in the “Price Objective” drop-down box. This option can be found just below the chart on the right side. After changing the method and clicking the update button, the Price Objective for the selected method will appear on the chart. See our P&F support article for details on other charting options. Click here for a live graphical P&F chart of the S&P 500. P&F Pattern signals can be found at the bottom of the Predefined Scans Page, which shows signals for more than 15 P&F patterns. Thomas Dorsey's Point & Figure Charting examines the basic ideas and key patterns of P&F charts. Dorsey keeps his analysis simple and straightforward; as a relative strength disciple, he devotes a complete chapter to relative strength concepts using P&F charts. These concepts are tied in with market indicators and sector rotation tools to provide investors with all they need to construct a portfolio. Additionally, Dorsey incorporates lessons on how to use P&F charts with ETFs. The Definitive Guide to Point and Figure, by Jeremy du Plessis, lives up to its title. Chartists can learn about 1-box P&F patterns/counts, 3-box patterns/counts and various trading strategies. du Plessis also shows how to apply P&F charting techniques to other analysis tools, such as relative strength and Fibonacci retracements, using plenty of real-world examples.